Moscow, Jan 6 (Just News): Russia has fiercely criticised the US for convening the UN Security Council over protests in Iran. Russia's envoy Vassily Nebenzia said involving the council in an "internal affair" damaged the top UN body. 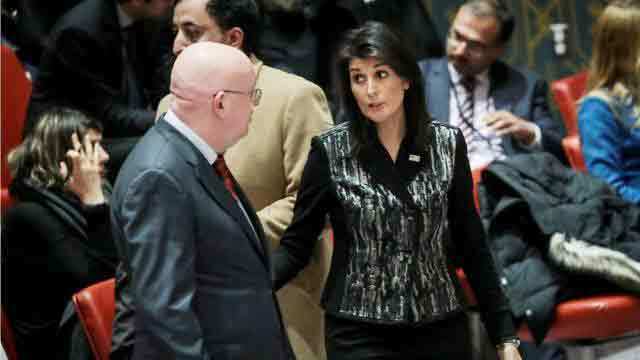 Minutes earlier, US Ambassador Nikki Haley praised the protests as a "powerful exhibition of brave people". Iran's ambassador said the US was abusing its power as a permanent member of the council. At least 21 people have been killed in the protests. They broke out in one Iranian city in late December against the state of the economy and quickly spread to dozens of cities, with slogans chanted against the government and ruling clerics. On Wednesday, the head of Iran's Revolutionary Guards declared the defeat of what he described as "sedition" in the country. A number of countries criticised the US for convening the emergency meeting of the Security Council. The US had "lost every shred of moral, political and legal authority and credibility in the eyes of the whole world", Iranian envoy Gholamali Khoshroo told the gathering. His Foreign Minister Javad Zarif tweeted to say that the Security Council had "rebuffed the US' naked attempt to hijack its mandate". At the meeting, France said any interference in Iran's affairs would be counter-productive and that recent protests there, while worrying, did not threaten international peace and security. Ambassador François Delattre said the international community must commit to fully implementing the nuclear agreement with Iran - which the Trump administration has refused to recertify. Ms Haley's call for the emergency meeting took Security Council members by surprise, and she had to lobby against Russian opposition to get it, says BBC UN Correspondent Barbara Plett-Usher. For an issue to be added to the council's agenda for discussion, it must be supported by at least nine of its 15 members. The US envoy told the council that Washington stood "unapologetically with those in Iran who seek freedom for themselves, prosperity for their families and dignity for their nation". But Mr Nebenzia of Russia said that if the US "logic" was followed, a Security Council meeting should also have been held after protests in Ferguson, Missouri in August 2014 sparked by the killing of an unarmed black teenager by a white police officer.